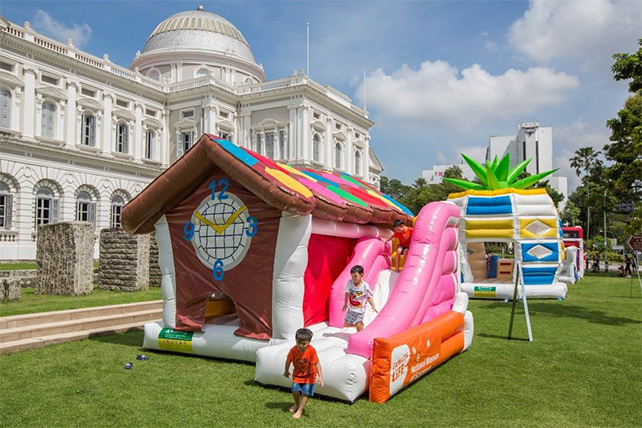 Embark on a bouncy adventure with interactive inflatable playgrounds that are inspired by iconic mosaic playgrounds of yesteryear. You can also go on an “”animal hunt”” with our animal springers for more bouncy fun. Enjoy complimentary light snacks and drinks from the Families for Life mobile café!. Or check out the kombi ice-cream van brought to you by Scoopy’s & Cream and get $1 off your ice cream with the museum entry sticke. Create your own hanging mobile inspired by The Dynamic Lines of Our Nest by Matali Crasset with your family at our drop-in craft station. Catch our special exhibition “Moving Memories”, which features a selection of Yip Yew Chong’s life-sized murals. These murals seek to express the romance of “places and moments…that blend sights, sounds, smell and taste.” Savour these moments of our tangible and intangible heritage, such as barbers in back lanes and fortune tellers, traditional kopi-making and road-side communal satay-eating, as they come alive through animation, soundscape and projection in Gallery 10. Pick up and complete the Activity Sheet to redeem a 3D model of our yesteryear playgrounds.